This paring knife has a 3 inch long blade, it is used for cutting smaller fruits and vegetables as well as garnishing work. This paring knife has a nice thin blade that is slightly flexible, excellent for garnishing. The handle is comfortable and it has a 3 inch long German alloy steel blade. NSF certified for safety and sanitation. A 4 inch version is also available. 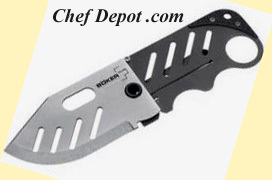 Click Here for riveted paring knives!! This is a 8 inch flexible Fillet knife, it is used for filleting fish easily and accurately. This knife will easily fillet dozens of fish in between sharpenings. We use a sharpening steel to hone the edge while filleting fish. The handle is comfortable and non slip with an 8 inch long German alloy steel blade. NSF certified for safety and sanitation. The knives feature Sanitized Antimicrobial Protection which protects the knife handle from bacterial growth. These knives meet all international safety and health standards. Click Here for Cutting Boards!! This is a specialty boning knife used in processing. This Mundial knife has a comfortable non-slip handle with a stiff 4 inch alloy steel blade. This knife will hold an edge for a long time and easily resharpens. We like it for filleting fish and boning out pieces of pork, beef and lamb. NSF approved for safety. We are certain you will like this knife! Chef Notes: A sweet knife for the price, the stamped blade in thick and strong at top and tapered thin. This is a great knife for quartering our large pieces of beef, elk, moose, bear or anything big. Nonslip comfortable knife. Also works for clearing brush and saplings. Our Chefs have used most every knife made - we conclude these are very high quality and comfortable to use. 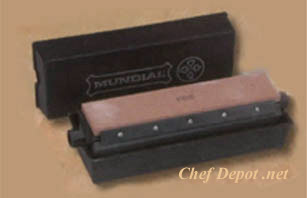 A Chef is testing out the riveted Mundial Chef knife set while preparing a appetizer. Notice, the knife is very sharp and cuts easily. A sharp knife is required by every Chef and Gourmet cook. The knife is featured in the set above. These cuts will take you practice to master. Chef is using one of his favorite NSF Maple Cutting Boards. These are made in USA! Prices vary by size. The pictured set is only $519.00 or less. Call for a quote ~ 630-739-5200 This one is 36 x 36 in. Square Table and Metal Restaurant Chair Set ( many other sizes). Set Includes 4 Chairs, Square Table Top and X-Base. Designed for Commercial and Home Use, Ladder Back Black Metal Chair, Heavy Duty Restaurant Chair, Lightweight Design, Black Vinyl Upholstered Seats, 2.5 in. Thick Foam Padded Seat, Fire Retardant Foam, 18 Gauge Steel Frame, Welded Joint Assembly, Curved Support Bar, Black Powder Coated Frame Finish, Plastic Floor Glides. Overall Size: 16.5 in W x 17 in D x 32.25 in Seat Size: 16.75 in W x 16.5 D x 19.5 H, Back Size: 15 W x 12 H Commercial Grade Table Top, 1.125 Thick Square Top, Natural Laminate Finish, natural light or dark walnut, High Impact Melamine Core, Black T-Mold Edge, 22in x 22in X-Base with 3in Diameter Table Height Column Cast Iron Construction, Easy 2-Piece Assembly with Single Bolt. Top Plate Pre Welded to Column. Black Powder Coated Finish! Prices vary by size. The pictured set is only $629.00 or less. Call for a quote ~ 630-739-5200 This one is our 30 in. Round Pub Table and Welded Metal Restaurant Chair Set ( many other sizes, 24, 36 and more). Set Includes 4 Chairs, Square Table Top and X-Base. Designed for Commercial and Home Use, Ladder Back Black Metal Chair, Heavy Duty Restaurant Chair, Lightweight Design, Black Vinyl Upholstered Seats, 2.5 in. Thick Foam Padded Seat, Fire Retardant Foam, 18 Gauge Steel Frame, Welded Joint Assembly, Curved Support Bar, Black Powder Coated Frame Finish, Plastic Floor Glides. Overall Size: 17 in. W x 18D x 42.25 in.H, Seat Size: 16.75W x 16.5D x 31 in. H, Commercial Grade Table Top, 42 in tall, 1.125 Thick Top, Natural Laminate Finish, natural light or dark walnut, High Impact Melamine Core, Black T-Mold Edge, 22in x 22in X-Base with 3in Diameter Table Height Column Cast Iron Construction, Easy 2-Piece Assembly with Single Bolt. Top Plate Pre Welded to Column. Black Powder Coated Finish! Prices vary by size. The pictured set is only $609.00 or less. Call for a quote ~ 630-739-5200 This one is our 24 in. Round Pub Table and Welded Metal Restaurant Chair Set ( many other sizes, 30, 36 and more). Set Includes 4 Chairs, Square Table Top and X-Base. Designed for Commercial and Home Use, Ladder Back Black Metal Chair, Heavy Duty Restaurant Chair, Lightweight Design, Black Vinyl Upholstered Seats, 2.5 in. Thick Foam Padded Seat, Fire Retardant Foam, 18 Gauge Steel Frame, Welded Joint Assembly, Curved Support Bar, Black Powder Coated Frame Finish, Plastic Floor Glides. Overall Size: 17 in. W x 18D x 42.25 in.H, Seat Size: 16.75W x 16.5D x 31 in. H, Commercial Grade Table Top, 42 in tall, 1.125 Thick Top, Natural Laminate Finish, natural light or dark walnut, High Impact Melamine Core, Black T-Mold Edge, 22in x 22in X-Base with 3in Diameter Table Height Column Cast Iron Construction, Easy 2-Piece Assembly with Single Bolt. Top Plate Pre Welded to Column. Black Powder Coated Finish! This is a 6 inch Boning knife, it is used for boning out pieces of meat easily and accurately. This knife is excellent for boning out venison and leg of lamb. It also works well to clean beef rounds and tenderloins. The handle is comfortable and it has a 6 inch long German alloy steel blade. NSF certified for safety and sanitation. Click Here for diamond sharpeners! !